Toluu is different from many existing feed reader and feed aggregators, in that it just doesn’t aggregate. It does, but it also does something more substantially useful. Toluu offers some neat ideas and twists on the usual feed reading services. It’s not a way to talk or communicate directly, hence it’s not a social network as such. Toluu is a central depository for your feeds and a library for finding other feeds that are similar to your own tastes. It’s easy to add feeds on the fly and check in feeds as and when you find them. You import your existing RSS feeds into Toluu as you can any other feed reader. The bonus is that this information is then correlated and used to determine your ‘style’ of sites, blogs, feeds etc. Then you activate the ‘Matches’ tab and here is generated the most useful aspect I have seen in any aggregator. As well as manually adding feeds, you can use the Toluu bookmarklet to automatically add a feed direct to your account. By hooking it up with Twitter from the preferences, you can inform all your buddies everytime you add a feed, plus you give off some good karma for promoting the site in question. Based on your existing feeds, it analyzes other Toluu members profiles and feeds and churns out results based on percentage match. For example, ‘User A” might share your passion for certain subjects, then the results will come higher, from this ‘User A’ will also have feeds that you are not aware of, and this is where it really shines. From this you are introduced to sites, blogs and feeds you might otherwise have missed. I have come across many new and interesting blogs, sites and feed that I simply did not know about, that are matched to my own tastes. Also, Toluu will notify you when a “friend” has added further feeds and contacts, so you can check out their profiles and see what they are interested in. If something rocks your boat, you can then add their feeds to your own profile. Toluu is a service that has fast grown on me. The mportant thing is that it will really shine the more people come on board, as there will be a richer store of feeds to measure and match from, thus you will benefit from discovering further feeds based on your own likes. Well recommend signing up and giving it a go. 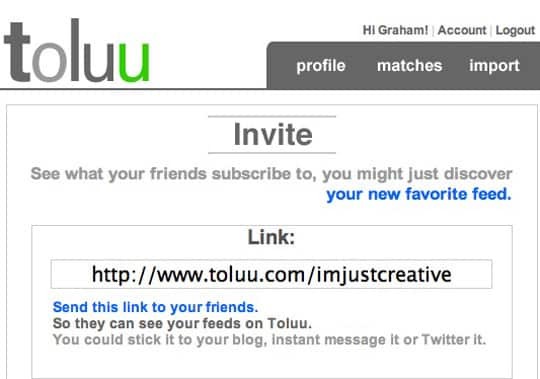 See my Toluu feed at http://www.toluu.com/imjustcreative. Sign up and add me as a contact. Well, it’s not a order, more a polite suggestion. If you want to take this for a spin, then I have a number of invites to pass on. Just leave a comment below and I will shoot one off to you.